If you’ve been reading Tattoo Blog for a while, then you’ll most likely know that I’m not the biggest fan of tattoo reality TV shows. Hell, I’m not the biggest fan of reality shows, period. That being said however, I know that there are plenty of people out there who just love a good tattoo reality show (“good” being a very subjective word here). 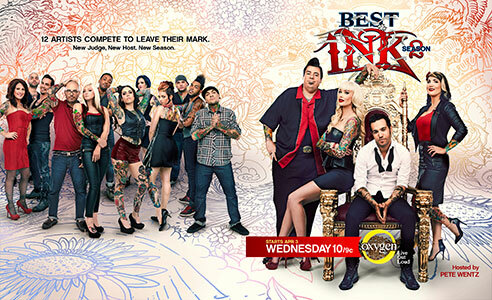 I’ve never seen the tattoo reality show called Best Ink, but apparently it pits tattoo artists against one another in a race against time to see who can do the best tattoos. It kind of sounds like Hells Kitchen with tattoos or something. Joe Capobianco is one of the judges. They start out with twelve tattoo artists and whittle the competitors down each week until there is only one remaining. It might not be all that bad, but it’s not for me. If you’re a tattoo artist age 21 or older, casting directors from Bunim/Murray Productions would like to meet you between 11 a.m. and 5 p.m. Saturday, May 4, at Mad River Chicago, 2909 N. Sheffield Ave. Applicants are asked to bring a recent picture of themselves that will not be returned, a photo ID and photos of their artwork, which will be returned. Sound good? If you want additional information on the audition, you can find it all here. The thing about a TV series such as this is that even if you don’t win the competition, you can definitely get your name out there and let others see what your work is all about. Some prefer to gain their notoriety through hard work and just doing what they love to do, with no promise of ever being hailed as an amazing tattooist. Others don’t. I guess it’s all up to you in deciding what path you and your art take. Whatever you choose, good luck to you and remember to always stay true to what you feel is best.